The Durban University of Technology’s (DUT’s) Vice – Chancellor and Principal Professor Thandwa Mthembu is currently engaging with various DUT stakeholders regarding the new 2020 – 2030 Strategic Plan. He delivered his presentation on the proposed, new 10 – year strategic plan that will cover DUT’s life; in a bid to obtain feedback and comments from the various DUT stakeholders, on the new strategic direction as well as on how to enhance the new plan, which he hopes will be approved by the faculty boards, student services board, UPRF, EMC and Senate to Council, by the end of November 2019. The Durban University of Technology’s (DUT’s) SRC and Student Parliament were given the opportunity to engage with the Vice – Chancellor and Principal Professor Thandwa Mthembu, who spoke on the University’s achievements, progress and challenges, in his strategic engagement, at Steve Biko Campus on 8 April 2019. Prof Mthembu delved into the background, current status and framework of DUT, and the two new proposed DNA strands namely: people – centred and engaged and innovative and entrepreneurial; explaining the values which support the DNA strands. “Nearly every cell in a person’s body has the same DNA. This is the idea we wish to replicate at DUT – that the DUT DNA is nearly the same in all we do,” he stressed. He also highlighted that in terms of student – centredness, this needed to be reviewed rigorously so that the structural integration could make better sense. Prof Mthembu also added that better alignment was needed for Durban and Midlands based campuses in terms of services, programmes, management and administration. “Archaic financial management and administrative systems are to be replaced with more automation and online systems,” he said. Another important issue he spoke about was on entrepreneurship, which he added, is now one of the three strategic project themes, in addition to e-learning and campus greening. Also, prioritising more on the fourth industrial revolution, new infrastructure and safety and security at the University, are all earmarked and proposed to be in the new strategic plan. 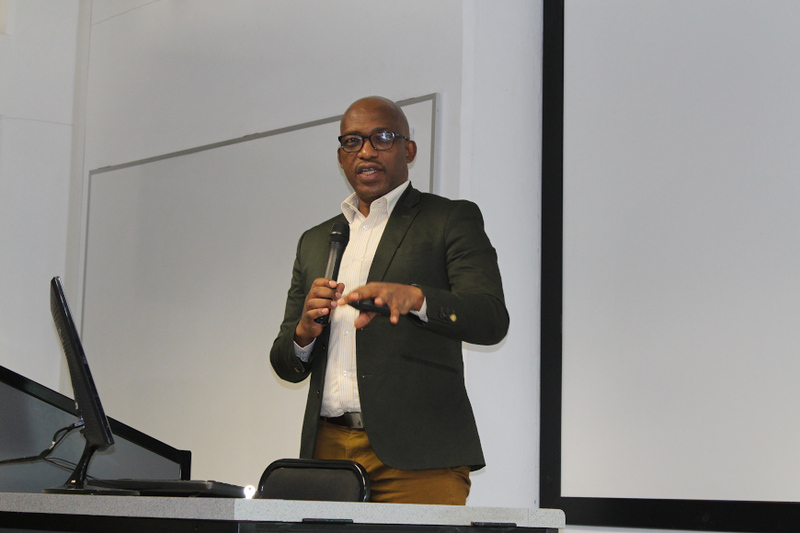 Prof Mthembu also said that there was also a great need to find the right people for the right seats, who are doing the right functions appreciably and focusing on using resources effectively and efficiently, at DUT. Pictured: Professor Thandwa Mthembu speaking at the event.